Seems rear fender rust is an issue with these cars. Anyone had it professionally repaired? I'd be interested in seeing the results of the labor. quality of work is a direct product of quality of labor put in and that's typically a product of how much you're willing to pay. I'm confused as to the ask, are you asking to just see what a regular unrusted fender looks like ? 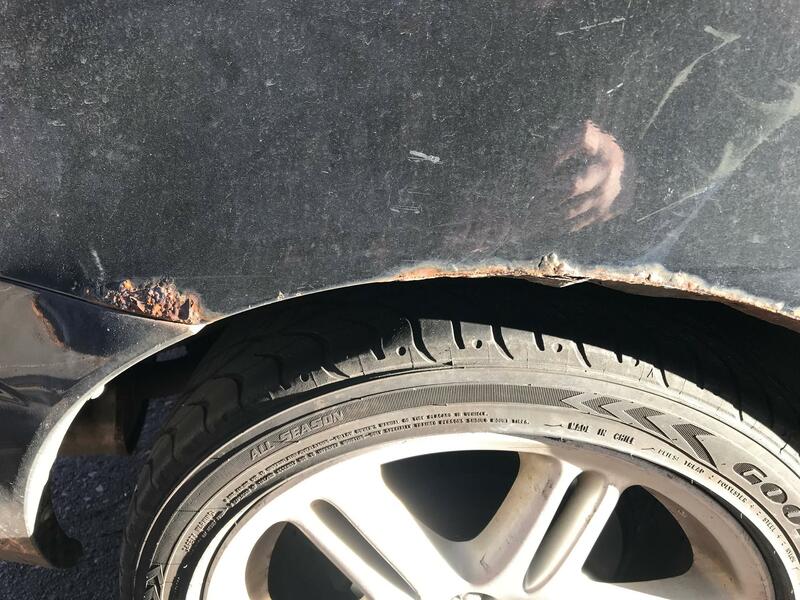 With rust, you're going to have to cut the fender out. There's no simple grinding the top layer away. With our fender being welded into place and continuing from the rear to the front at the top of the windshield, there's no replacing the piece. Cutting is the only way. I was curious to see the work others have had done. Even with high quality work, I can't imagine it can look as it originally did when completed. I'm curious if it's worth paying the $1000 or so to have it taken care or if I should just live with it. Do you have pics of how bad yours is? I had my entire car repainted at my dad's shop. If there's rust the proper way to fix would be to cut it out. I consider it a cancer you're better off doing it right the first time. Whoever fixes it for you should also spray rubberized undercoating in the wheel wells. The only right way to repair rust perforation, is to cut out the rusted area, weld in new metal, and treat the metal as DMateo says. I've made attempts at repairing rust through, in the rear wheel lip area, none of which proved permanent. Rust Never Sleeps, so they say. The only right way to repair rust is to cut it out and weld in a replacement piece as frankjnjr said DMateo said, TheWeez said, and thoiboi alluded to. Meh, I'll just let it go. I love the car but it's not worth dumping a bunch of money into a vehicle only worth $5k max in mint shape. Poor financial decisions doesn't change the value of a vehicle. Just because someone puts $10k rims on a $2k Cutlass doesn't mean the car is now worth $12k and just because I put a turbo on my M3 doesn't mean it's now worth the additional $6k I spent buying and having it installed. I've owned this car for 10 years and gotten great value from it, doing little more than general maintenance and it runs wonderfully. Still seems a bit silly to spend $2k+ to fix a cosmetic issue like this when it's not going to really impact the longevity of the vehicle. Sure it impacts the looks a bit but even putting that money into it isn't going to positively impact the value much. A car that's had body work is a car that's had body work. As a car enthusiast, most decisions we make might seem poor to someone who isn't. At the end of the day you need to evaluate whether or not it's worth it to you. If it's not then just drive it as is... not much rocket science involved here. I'm curious if it's worth paying the $1000 or so to have it taken care or if I should just live with it. I think you answered your own question in your previous post... clearly it's not worth it to you. Rust never sleeps. Just another form of attrition to gradually eliminate these cars. Glad I got one that spent its life in the southern states. That's the exact price my body shop quoted.